The above unusual image is a detail of an Original Harold Edgerton 1934 Super High Speed Photograph showing former Ohio State football great Wes Fesler kicking a football. An M.I.T. Electrical Engineering Professor, Dr. Edgerton (1903-1990) became world famous for his invention of the high speed flash tube that allowed for super high speed photography, known as strobascopic photography. Many of his high speed photographs are a part of popular culture. His famous images of the bullet piercing an apple and milk dripping into a saucer are considered to be works of art as much as demonstrations of scientific acumen. His original photographs are held by the Museum of Modern Art, London's Albert and Victoria Museum and the International Museum of Photography. Edgerton later developed night aerial photography used during World War II, and underwater photography techniques used by Jaques Cousteau. 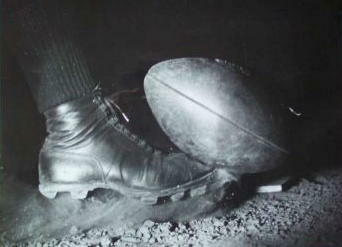 This original/vintage Edgerton 9x7 inches gelatin-silver photograph was part of a series of three photographs that comprised history's first ever super high speed photographs of a football player kicking a football. The photograph was taken in Edgertons laboratory. 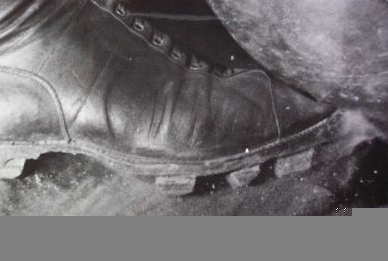 The kicker, Wes Fesler, was a Harvard University basketball coach at the time of the photograph, and earlier a three time All-American at Ohio State. Fesler is a member of the College Football Hall of Fame and appears in the 1955 Topps All-American trading card set. He also was the head football coach at the University of Minnesota. The image was taken at 1/100,000th of a second. The image is crystal clear. This photograph was owned by the ACME News Service, New York City. The back has ACME and United Press stamping and the original 1934 printed description. This complete but brittle paper tag is lengthy and gives all the details about how the photograph was taken and its history. A rare, significant and unusual football photograph.